Are you considering getting into a network marketing business? Before you jump into an MLM business opportunity, do your research to find out if the opportunity is viable for you. Network marketing is not for everyone but may be for you! It’s exciting to get started with adding a new stream of income and planning for a successful future! 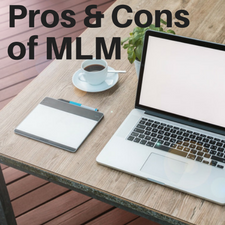 In this post, I’ll help you understand the pros and cons of MLM as well as the best way for you to succeed. Multi-level marketing is a business model where people get commissions for product sales and compensation for the sales of people in their downline. There is usually no network marketing advertising at the company level. Network marketing sales depends on its distributers sharing the products and business opportunity with others through direct selling, word of mouth marketing, referrals, online marketing and more. There are many advantages and disadvantage of building your network marketing business. This business model has been criticized over the years by many and yet praised by others. It’s best to do your research into the best multi-level marketing companies before getting involved. I’ve known people who joined MLMs without knowing anything about the company! Let’s get into the pros and cons of MLM in general. What are the Pros of Network Marketing? The network marketing business model has been around for years and it works. It’s based on residual income, meaning you do the work one time and have the potential to earn ongoing income from that work. Most MLM companies are well-established with quality products that people love. Companies also have fair compensation plans in place as well as tons of training on how to work the business. You can get started with your own home business for about $200. It’s a low cost way to start a business that can potentially grow into a six-figure a year business when you put the work into it. The monthly maintenance fees are low compared to the potential compensation you can gain. Most MLM companies require you to be on autoship of a top selling product. Each company is different so explore what the requirement is. Usually you will be looking at $100 a month investment. Don’t fret. If your ROI is high, that investment will be well spent. You can learn lots of new skills in MLM, if you are open to it. Most companies have a lot of personal development and business training available as well as weekly conference call. If you are an action taker, you’ll build up your skills in no time! I learned more skills in my MLM company than I ever did in traditional employement! One of the best advantages of network marketing is the awesome products! You can easily divert your purchases from retail stores to the MLM products you sell. Then you’ll know even more and be able to share with more passion. Be sure to research the various products from the companies you are looking at. See if you can get product samples to determine if they work for you. Having a flexible schedule is the best! When I started in the MLM industry, I also worked full time. I was able to work on my home business early in the morning or later in the evening. I also called many network marketing leads during my lunch time. It worked out and I was able to grow my business into a full time income! You can take full advantage of the Internet to build your business. While many direct sales are made face to face, a large percentage are also made online. I built my MLM business on the Internet using blogging and social media. 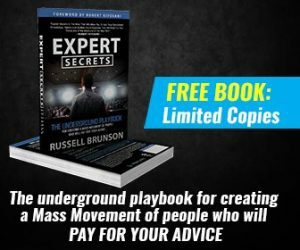 It’s a way to meet more people and get your message out to the world. What are the Cons of MLM? You may have heard that MLM has a high turnover rate. Yes, it does. Many people join with the hope of achieving financial freedom and living the life of their dreams. But … few get there. WHY? Most people start out enthusiastic but fail to move forward because they are not willing to step out of their comfort zone or work hard. 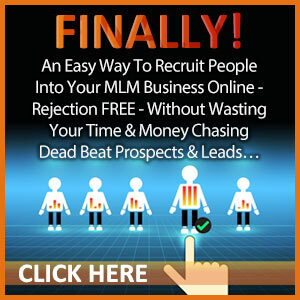 The majority of people you share your MLM products or business with will reject your offer. That’s right! Can you deal with that? There is a simple solution. That is, find more people to talk to. 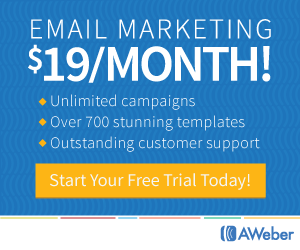 You do that by consistently generating new leads for your business. Just remember that prospects are not rejecting you. They simply are not interested in starting a business or perhaps your products are not a good for them. Building your network marketing business takes hard work. Remember, most people are not willing to do that. Therefore, most distributors don’t make money. 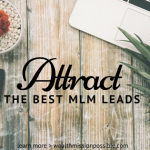 Although this is in the cons of MLM list, you get to decide if you will make money or not but the level of work you put into it and skills you are will to learn. While few people get wealthy in network marketing, others succeed with 6-figure incomes. As you learned in reading the good and bad about MLM, if you are willing to take the necessary action, you can succeed. 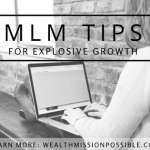 MLM is an incredible way to own your business with the potential for residual income. Regardless of what you hear from others, the earning potential in network marketing is still greater than that of a traditional job. If you are considering starting a multi-level marketing business, do your research. If you are looking for guidance on how to work your business online, check out how to Make Money in YOUR Home Business in 10 Days.